Mornings can be hard but this 3-Minute Microwave Egg Bagel Recipe can make it a little bit easier! Not only does this egg bagel have a nice and fluffy texture, it’s filling and yummy as well! You’ll love them so much, that you may want to make a couple extra as well! For another fun breakfast idea, try our Breakfast Kabobs! Affiliate links are used in this post. We’ve heard it said a million times, that breakfast is “the most important meal of the day”. Still, we often rush through breakfast as we hurry on our way to work or school. I have a recipe that is my absolute favorite breakfast and best of all – it’s fast and easy to make! When you’re gathering Christmas morning, this recipe will fill your families bellies and get them filled all through opening up the presents. Best of all, clean up after breakfast will be a breeze! 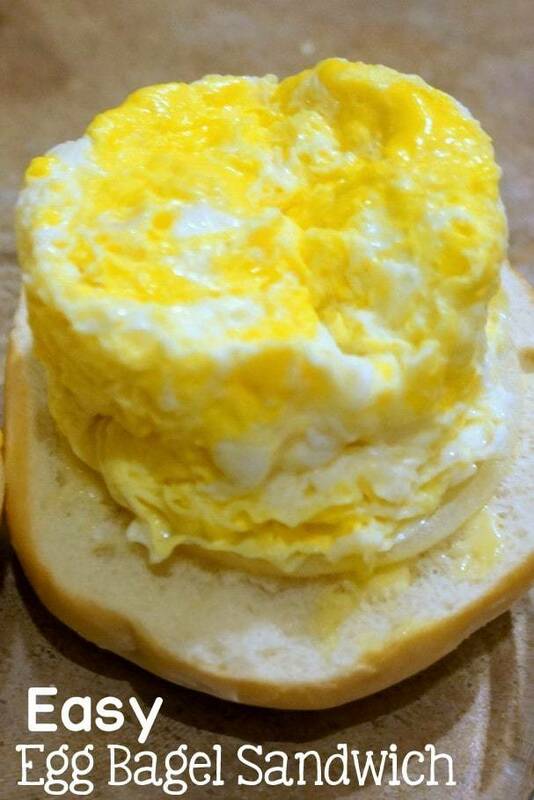 We used to make our breakfast sandwiches by buttering the cup first. 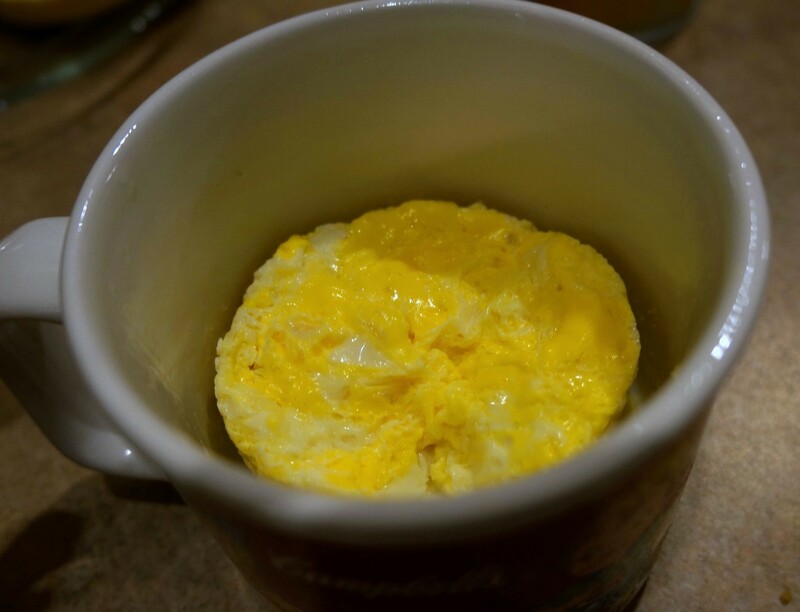 It took longer, added in the extra fat of using butter, and while the eggs would come out of the cup just fine, what was left behind was nearly impossible to get off the cup! Our soup mug would sit in the sink for a couple of days soaking and being scrubbed at every time I washed dishes as I dreaded the work it would take to actually clean the mug. Non-stick original cooking spray is a great option to save some time and calories! Start by popping a bagel into your toaster. While that is toasting, spray a wide-mouthed mug with a non-stick spray of your choice. Crack two eggs into the cup and mix the eggs together with a fork. Then, just pop the mug into your microwave and cook for 80 seconds, or until cooked through. Microwave times may vary, but your eggs should be cooked through and remove easily from the cup. Thinly slice a yellow onion. Lightly butter your bagel as soon as it pops from your toaster. Add a slice of cheese on one half of the bagel and onions to the other half. When your cooked eggs are ready, flip over the cup onto your bagel and put the bagel together as soon as your egg finishes cooking to allow your cheese to melt. You can also add bacon or sausage to round out your breakfast sandwich if desired. 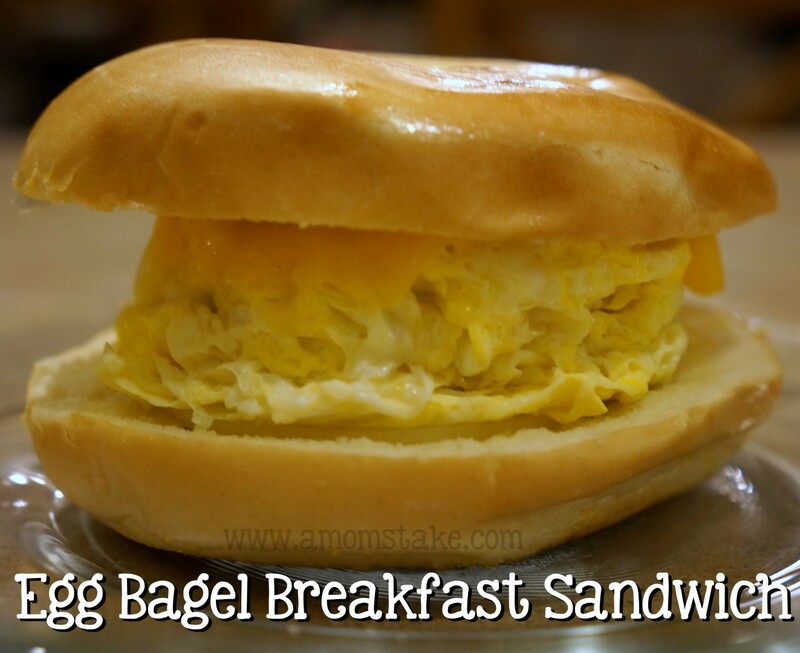 In the end, you’ll have a mouthwatering delicious Egg Bagel Breakfast Sandwich! This is one recipe everyone in our house can’t get enough of. Q: Will an egg explode in the microwave? A: If you cook the egg in its shell, then yes, it will. However, for this recipe, no eggs should be in their shell when cooking in the microwave. Q: Can you overcook an egg in the microwave? A: Absolutely. If your egg is rubbery or hard, it was cooked too long. Q: What herbs would you add to these microwave eggs? A: Cilantro would be fun, as would chives. Depending on your taste buds, you can add anything that you’d like. Salsa is also another great option! IF YOU LOVE THESE EASY GERMAN PANCAKES, SPEND A FEW MINUTES TO SEE THESE OTHER BREAKFAST RECIPES THAT WILL BE AN AMAZING PART OF YOUR RECIPE COLLECTION! Try this flavorful Berry Dark Chocolate Crunch Parfait that’s certain to wow your taste buds! Don’t forget to give these Swedish Pancakes a try! If you love this fun recipe, you’ll definitely enjoy these No Bake Peanut Butter Cereal Bars! CONNECT WITH A MOM’S TAKE ON YOUR FAVORITE SOCIAL CHANNEL FOR MORE RECIPES! Click below to print/save this recipe or pin it to bookmark! Fast, easy and healthy breakfast that tastes delicious! 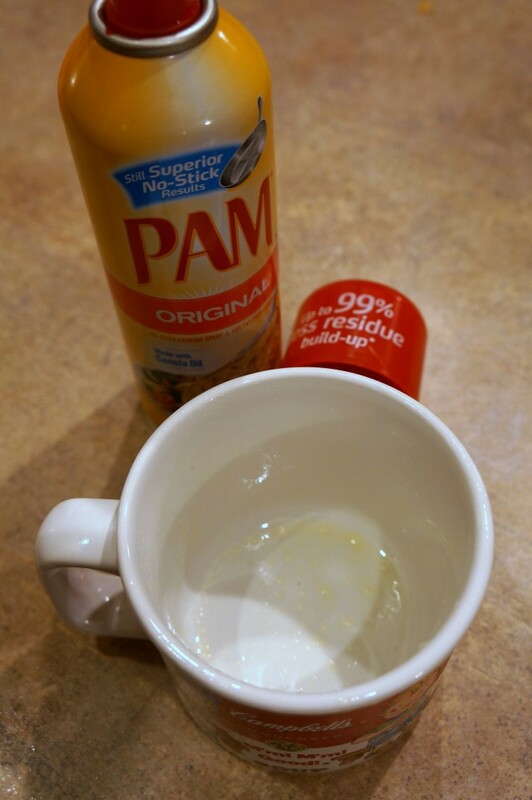 Spray a wide mouth mug with Pam cooking spray. Toast your bagel to warm it. Cook it on a low timer setting so it isn't hard and crunchy but still very soft and warm. While your bagel cooks, crack two eggs into your mug. Mix them together. Cook in your microwave for 80 seconds or until cooked through. Lightly butter your bagel. Layer one half with a slice of cheese and the other with thinly sliced onions. 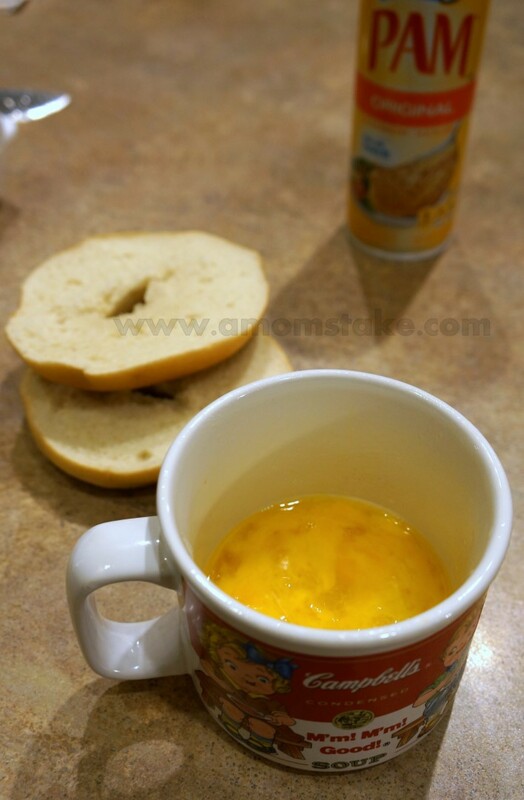 When your egg is done, invert the mug to drop the cooked eggs right onto one bagel. Replace the top bagel and enjoy! Get recipes right to your inbox – Subscribe! What are your “Smart-tips” to make your dish perfect the first try?